Registration of Three-Self Church believers moves naturally to controlling what Christians read and hear in sermons, transforming churches into stealth Party branches. Bitter Winter has reported about the massive effort underway to register all Christians. The registration work is ongoing, but the Chinese Communist Party (CCP) is more and more putting to use the information collected to transform Chinese belief. 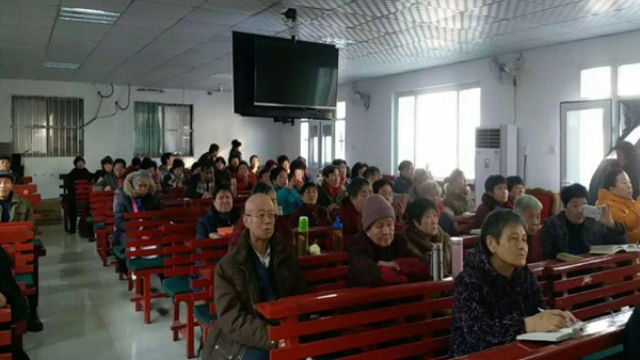 On January 2, more than 40 Three-Self church pastoral staff in Ningde city in southeastern China’s Fujian Province were called together. Officials from the city’s United Front Work Department declared that registration information allowed them to identify 46 people from Three-Self churches who had joined other denominations. The pastoral staff were criticized for failing to understand the dynamics of believers and letting them “get away” into non-controlled churches. Officials ordered the pastors to determine movements of believers, ascertain their ideologies, and learn which believers have joined other churches. They warned the pastors that if they neglect these duties, they will be held accountable. As punishment, their wages will be deducted, their pastoral duties will be revoked, and, in severe cases, they will be held criminally responsible. Similar regulations are in place in Putian city in Fujian. Local Three-Self churches completed the registration of members and submitted photocopies of ID cards to the local government. Officials from the Religious Affairs Bureau then ordered pastors to count the number of people attending church services and compare them to registration lists. Any strangers who have not been registered and whom the church leader does not know will be arrested immediately. A local government official also revealed that authorities had assigned one police officer to supervise five churches to track the movements of Christians. If the officer discovers anyone participating in religious activities beyond the scope of his or her supervision, the person will be arrested. “According to the government’s approach, the church has already become a unit controlled by the government,” the leader of a Three-Self church said. Do not hold large-scale religious events. Do not set up donation boxes. Do not compile, print, or release religious internal resource publications. Do not sell religious supplies, artwork, or publications. Do not build open-air religious statues. Do not put up religious symbols outside the venue (crosses, church name plaques, etc.). Do not conduct religious training. Do not carry out social activities (including charitable activities). Do not allow foreign persons to participate in church activities. Do not accept foreign donations. Only after completing these requirements was the venue allowed to hold gatherings. Another Three-Self church in the same city was forced to remove the church’s cross after signing a commitment statement. Restrictions on religious books also demonstrate the authorities’ attempt to control believers’ thoughts. A believer from a Three-Self church in Jixi city of northeastern China’s Heilongjiang Province revealed to Bitter Winter the scrutiny churches endure. He says the local Religious Affairs Bureau comes repeatedly to their church for unannounced inspections. Believers are prohibited from using any books or songbooks not published by the China Christian Council, such as Sweet Dew Songs and Glorious Worship. Officials also conduct stakeouts at the church to monitor compliance. 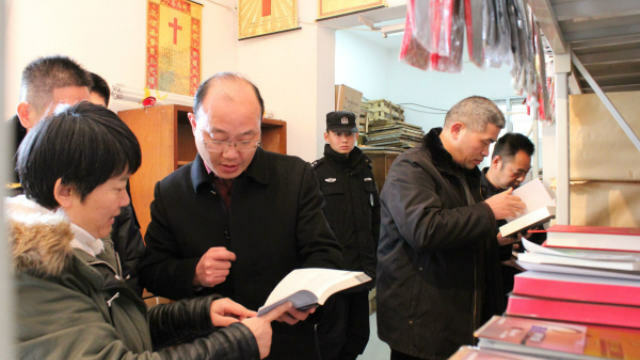 On January 16, officials from Zhangjiagang City’s Ethnic and Religious Affairs Bureau and some other government departments inspecting “illegal” religious books in a church. A believer from Sitan Three-Self Church in Wenzhou city, in Zhejiang Province, reported that the city’s Religious Affairs Bureau uses cellphones to record the church’s gatherings. In addition, the government screens the content of the church’s sermons. Phrases such as “the Lord is coming soon” or “the Lord is our king” must be deleted from songbooks. Two Three-Self churches in Heilongjiang’s Jiamusi city, and Taoxi Church in Qitaihe city, have also been prohibited from using books that have not been “officially” published. While believers are prohibited from reading non-official religious books, the “four requirements” campaign to transform churches has escalated. Works of traditional Chinese culture, biographies of “Great Men,” and books on the “red revolution” have been introduced into churches. Believers are forced to study anti-religious regulations. The Four Requirements event held in Shengfu Christian Church of Lixia District, Jinan city, on January 24. In October, the authorities demanded that a Three-Self church in Harbin’s Xiangfang district study laws and regulations, including the new Regulations on Religious Affairs. Church leaders must take photos showing believers studying and send them to the Religious Affairs Bureau. Liu Yi, a pastor with the Chinese Christian Fellowship of Righteousness, said that the political mission of the state-approved church has not changed since the CCP established the Three-Self Patriotic Movement. Specifically, its political mission is to transform Christians according to the Party’s wishes, so that China’s followers of Christ turn into “followers of the Party” cloaked in Christian garb.